We’ve just finished up the work on the chicken coop for the year. 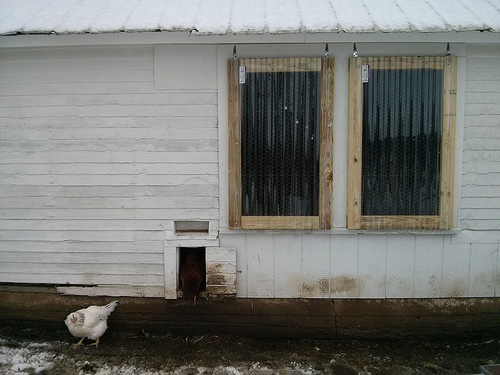 With winter looming we knew that there were a few items in the coop that needed to be addressed. First up, replace the overhead electrical line with a newer safer line that actually has some insulation left on it. 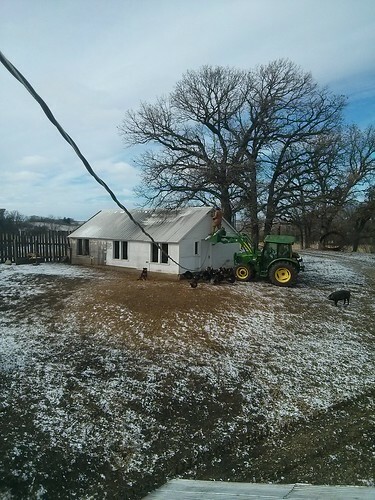 With a little more conduit and wire run inside the barn, we got electrical service restored to the coop. 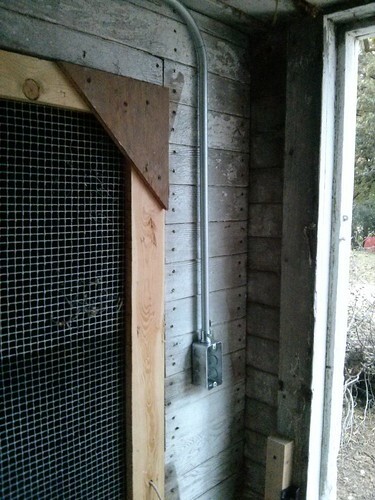 Inside the coop, new conduit and wire was run. 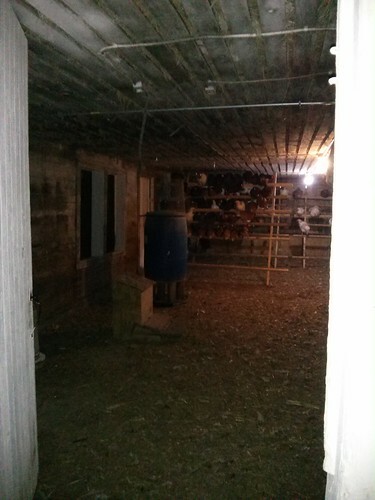 We now have 3 lights and 3 GFCI outlets in the main part of the coop, with another light and GFCI outlet in the feed room. That gives us plenty of room to plug in heat lamps for the chickens and the de-icers that we use to keep the Mega-waterer thawed out all winter. During these, the shortest days of the year, the lights sure make it easier to go collect eggs at the end of the day. It’s the little things like this that make for happy farmers. And happy farmers make for happy chickens. 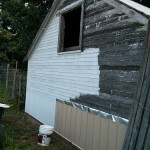 Earlier in the summer we’d covered the windows in chicken wire. 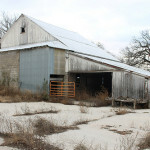 That’s great for keeping predators out and chickens in, but it doesn’t do much to cut down on the cold winter breezes. We fabricated these windows out of 2×4’s and some polycarbonate roofing panels. They’re hinged at the top, so we can prop them open next summer to let the breeze through again. So far they’re working great. They let in the sunshine (they face South) and block the wind, making it much more comfortable in the coop, even when the temperatures turn negative. Back behind the coop, there were plenty of buckthorn trees that were growing up along the foundation. Cutting them out with a chainsaw wasn’t really an option, as most of them had grown up through some old rolls of wire fencing. 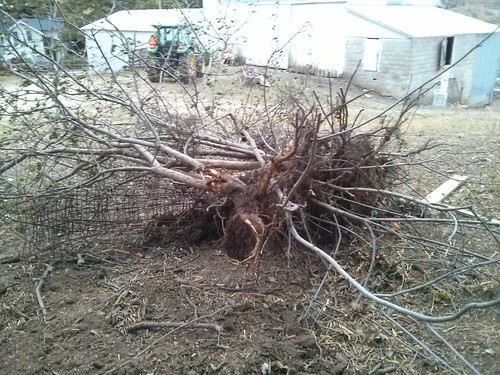 In the interest of keeping our saw blades sharp, we elected to pull the trees out with the tractor. 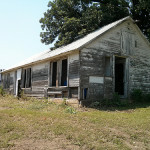 Of course, after the trees were pulled, the true extent of the damage to the coop became visible. 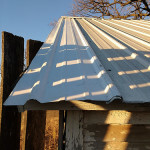 The years of accumulation of dirt, leaves and tree roots had rotted away the sill plate and almost all of the studs along the bottom of the wall. 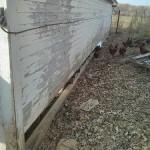 It looks an awful lot like the other wall of the coop that we fixed up earlier this summer. Unfortunately, with the weather turning colder, there wasn’t much time to fix it this year. 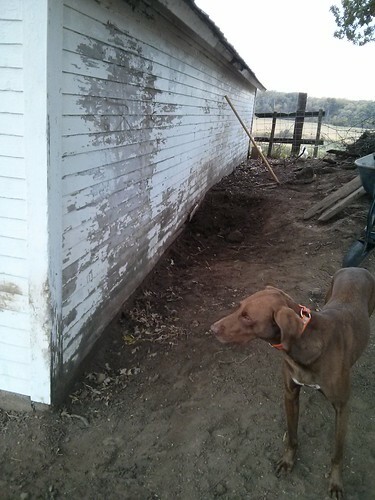 Instead, we dug out a lot of excess dirt, exposing the concrete foundation, and covered the rotted siding with a plastic sheet and plenty of straw to keep it in place for the winter. 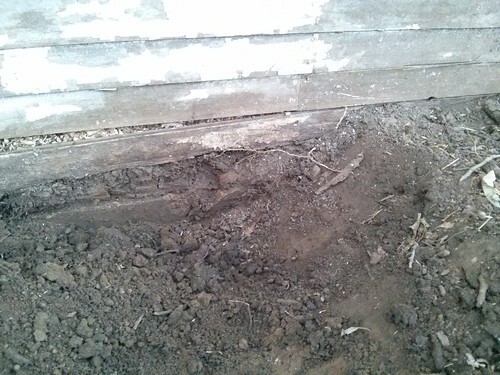 At least the drainage is fixed now, so that all we have to do in the spring is replace the sill plate and studs that rotted away.